Saturated fats, such as those found in butter, hard margarine, lard, cream etc. These increase cholesterol. Monosaturated / Polyunsaturated fats, which are the good fats that help reduce cholesterol. (src Strokelink – The stroke magazine of the Irish Heart Foundation pg 30/31). Using Rapeseed oil instead of more traditional Irish fats is one of the recommendations the Irish Heart Foundation make. Rapeseed oil also contains not only beneficial omega-3, but omega-6 and omega-9 as well! Strictly Wicklow is a local food guide for the Garden of Ireland. It exists to promote the amazing array of Wicklow food producers, markets and wild food. 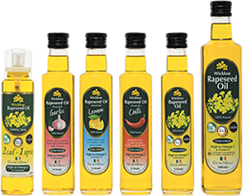 The Irish food board site is a great resource and has plenty of recipes that use rapeseed oil on it too. Established in 1999 the Food Safety Authority is an independent, statutory, science based body. It is dedicated to protecting public health and consumer interests in the area of food safety and hygiene. The principal function of the Food Safety Authority of Ireland is to take all reasonable steps to ensure that food produced, distributed or marketed in the State meets the highest standards of food safety and hygiene reasonably available and to ensure that food complies with legal requirements, or where appropriate with recognised codes of good practice.